A simple, but far from easy, rule of environmentally responsible living is to avoid throwaway items and substitute reusable items instead. It's difficult to follow because disposable items are so handy and relatively inexpensive. To put convenience items in perspective, think of their real cost  an analysis know as life-cycle or cradle-to-grave economics. For example, manufacturing processes often cause environmental damage and produce harmful byproducts that we don't pay for directly. The real costs aren't clear. It can be easy to overlook tradeoffs of time and energy in using disposables. Consider disposable plates, glasses and silverware: Is it really easier and less time-consuming to go to the store, select and purchase items, transport them home from the store, and later take them out to the garbage, over and over again? The short-term economic costs of garbage pickup are significant enough, much less the long-term cost of landfill disposal. One easy change is to use cloth napkins instead of paper ones. Many people are reluctant to make this change because they don't want more laundry. But you won't have to use a new napkin for every meal. Many people who use cloth napkins reuse them several times before they wash them. I first learned about this while traveling in France. The family I visited tied or folded their napkins in different shapes after using them. They were kept in a basket between meals and reused until they were washed or you decided you needed a new one. 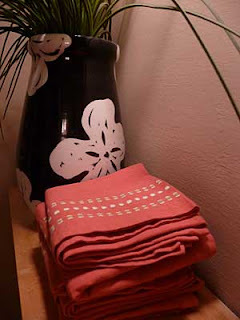 If you want to reduce and reuse even more, you don't need to go out to a housewares store and buy new cloth napkins. Make your own from leftover fabric. I've made napkins from the unworn sections of old sheets. For everyday use, you don't even need to hem them. A fringed edge is a common decoration on store-bought napkins.